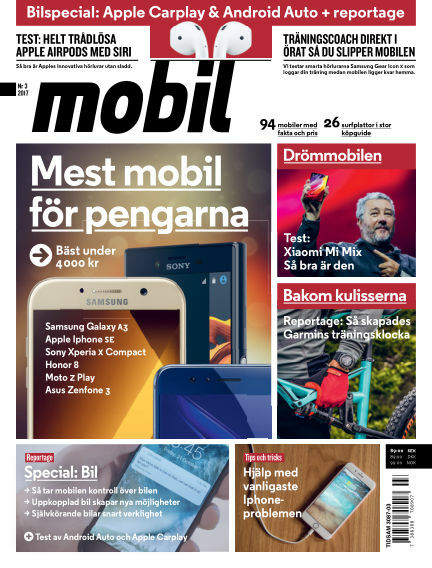 In this issue of Mobil Sverige : Bilspecial: Apple Carplay & Android Auto + reportage. Så tar mobilen kontroll över bilen. Uppkopplad bil skapar nya möjligheter. Självkörande bilar snart verklighet. Mest mobil för pengarna - bäst under 4000 kronor: Samsung Galaxy A3, Apple Iphone SE, Sony Xperia X Compact, Honor 8, Moto Z Play, Asus Zenfone 3. Test: Xiaomi Mi Mix, Apple Airpods, Samsung Gear icon X.
Reportage: Så skapades Garmins träningsklocka. Tips och tricks: Hjälp med vanligaste Iphone-problemen. 94 mobiler med fakta och pris. 26 surfplattor i stor köpguide. With Readly you can read Mobil Sverige (issue 2017-04-04) and thousands of other magazines on your tablet and smartphone. Get access to all with just one subscription. New releases and back issues – all included.